1. Check glucose levels more frequently. 2. Have someone over occasionally and make a meal for them. 3. Attend church more frequently. 4. Write more consistently for But You Don't Look Sick. 5. Pay down the debt for the basement repairs as quick as possible. That's all I can think of. I'm reallllly brain fried. Gonna stay home tonight and just watch VH1's "Top 100 Hard Rock Song" countdown. Wishing everyone a happy and healthy 2009! 2008: the year in FOOD! I did manage to keep one resolution for 2008: cooking at home rather than eating out. I used recipes mostly from the local newspaper, a few from the internet, a few from health magazines. Most of the dishes were the one-pot type, something fairly simple that didn't require too much time or brain power. Got this off the Whole Foods Market website. Contains tofu, obviously, but also green bell pepper, yellow onion, corn, gluten-free veggie broth, kidney beans, diced tomatoes and tomato sauce, chili powder, cumin, and gluten free soy sauce. The pepper, onion and corn are sauteed, and then you throw all of it in a soup pot and let it simmer for 45 minutes. Dan, who thought he hated tofu, actually likes this better than I do. USA Weekend magazine had a section on doing a picnic using foods with an Indian flavor. The recipe calls for the chicken to be grilled, but I just used my rotisserie with excellent results. To make marinade, you heat cumin, curry, garlic, salt, ginger and cayenne pepper briefly, then add them to red wine vinegar and yogurt. You can soak the chicken in the marinade for up to 24 hours if you refrigerate it. Then you're ready to cook the chicken. This was AWESOME! This is meant to accompany the previous recipe. This calls for soaking cucumber slices in salt before assembling the salad. Then add them to yellow bell pepper, carrots, tomato and red onion. The dressing is very simple: rice wine vinegar, oil and pepper. Meant to accompany the previous two recipes. The sauce consists of ginger, lime juice and honey. This is mixed into mango, green grapes, berries (the recipe says blueberries, but I found raspberries tasted just fine) and fresh mint. This lives up to its name. Sliced polenta, pepperoni (I used turkey pepperoni because it has 70 percent less fat), mozarella (I used reduced fat) and pasta sauce are layered in a dish and microwaved. Only problem I had was the cooking time was way off, but once I got it hot enough, it was delicious. Another recipe where I subbed the rotisserie for a grill. This has a simple marinade of yogurt, cilantro, extra virgin olive oil, garlic, paprika, cumin, salt and pepper. After marinating in the fridge 6-10 hours, the chicken is ready for cooking. Got this simple recipe off the box of rice noodles, heh heh. The noodles are soaked in near boiling water until they soften. Then you heat oil in a wok (recipe calls for veggie oil, but peanut oil is better) and cook either chicken, tofu or shrimp. Add the noodles, fish sauce, gluten free soy sauce, optional sugar, and you're done in about five minutes. Onions, corn, garlic, chicken, cumin, chili powder, oregano, salt and pepper are cooked in a skillet. This mixture is placed on tortillas (I used gluten free ones made from teff) along with Monterrey jack or cheddar, goat cheese and cilantro. Then the filled quesadilla is heated; I found that the GF tortillas tasted better microwaved rather than grilled. These are good with salsa and sour cream. Got this off the internet. It says to marinate mushrooms, gluten free soy sauce, sherry (I used cooking sherry), ginger and garlic for 30 minutes, then throw it in a wok with tofu, carrots and snow peas (I think I just used regular frozen peas). This is a whole meal done mostly on the broiler. Asparagus and bell pepper are drizzled in olive oil with salt and pepper and broiled alongside chicken that has been coated with salt, pepper, cumin and oregano. You are supposed to serve it with hummus and pita bread, but I couldn't find any that was gluten free, so I skipped that part. Another marinated meat recipe. This one has garlic, cumin, lime juice, orange juice, salt, pepper, oregano, and cilantro. The pork can marinate overnight, with some of the marinade reserved for using as sauce after the pork is cooked. This is a great way to use up leftover rice straight from the fridge. You scramble eggs in a wok, reserve them and then heat up onion, garlic, red bell pepper, and any other veggie of choice (I used a frozen Asian blend). Add some ham, the cold rice, the cooked eggs and some gluten free soy sauce, and you've got supper. Chicken is cooked with garlic, curry powder, rice, chicken broth, peas and cilantro all in one skillet. Easy and tasty. Another one skillet recipe. This one uses extra lean ground beef (turkey would work too), chili beans, chili powder, cumin, garlic powder, cooked pasta shells (I used GF), colby jack and reduced fat cheddar. You're supposed to add canned enchilada sauce, but I couldn't find any that was gluten free, so I had to make my own. For the Taco Pasta Bowl recipe. Basically involves simmering onion, chili powder, cumin, garlic, crushed tomatoes (I used diced), sugar, red wine vinegar and cilantro. Very easy recipe I got from But You Don't Look Sick. You put wild rice, mushrooms, onion, garlic and GF veggie broth (chicken broth works well too) in a casserole dish and bake it for 90 minutes. A one-pot wonder containing onion, corn, potatoes, chicken broth, salt, pepper, and milk with some corn starch dissolved in it. Only stumbling block for me was getting the potatoes cooked thoroughly because I didn't cut them small enough. Tasted good when it was done though. This is watermelon cubes with feta cheese, parsley or mint (I recommend the mint) and a dressing consisting of olive oil, lime juice, red wine vinegar, salt and pepper. Easy, especially if you buy the watermelon pre-cut, and very tasty summer salad. Got this off About.com. Like the other recipe, you soak the rice noodles first. The chicken or tofu is marinated in corn starch that has been dissolved in GF soy sauce. 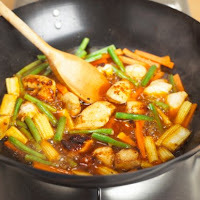 The stir fry sauce contains soy sauce, fish sauce, sugar, lime juice, chicken stock and Thai chili sauce. After the meat is cooked in the wok, you put in mushrooms, red bell pepper, the noodles, the stir fry sauce and bean sprouts. I eat this with extra chili sauce on the side and LOVE it! Here is an excellent way to use up leftover holiday turkey. You combine it with celery, Granny Smith apples and raisins (or dried cranberries, although I left them out and it was fine). The dressing is mayo, yogurt, nutmeg, cinnamon, salt and pepper. This combines penne pasta (I used GF) with sauteed chicken, blanched asparagus, red bell pepper and green onion. I used ready-made Thai peanut sauce instead of the dressing recipe, and it was amazingly good. You cook the cutlets in the skillet with a coating on top of Parmesan cheese, parsley and pepper. Then you make a sauce from the pan drippings, adding white wine (I used cooking wine). Yummy. Another wok concoction. This has tofu (or chicken or steak), frozen mixed veggies, ginger, garlic, pineapple juice (I added pineapple chunks) and cilantro. This is served with already cooked brown rice. The Waldorf salad I had as a kid was apples, pecans and celery with mayo. This omits the mayo and replaces it with whipped cream. Also in this version are pineapple, red grapes, and marshmallows (I think you could easily leave the marshmallows out though). This calls for freezing the salad and serving it with maraschino cherry and mint on top. I decided to skip that step and found it was delicious without freezing. A good way to use up any leftover veggies. The basic recipe calls for potatoes, corn, celery, carrots and onion, but I didn't have any carrots or onion, so I left them out and everything still tasted fine. You boil the veggies, drain them and then heat them up with milk that has been thickened (I used corn starch to stay GF). Optional additions: veggie broth, brown rice, other veggies (I used frozen peas). All this mention of cooking has made me hungry, but it's wayyyy past my bedtime, so I guess I'll just have to dream of food, heh heh. We've sung the carols, lit the candles, carved the roast beast. I'm winding down Christmas night now with one last piece of traditional instrumental music and some blueberry tea. 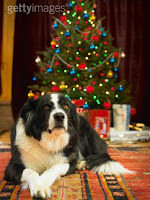 And I just downloaded an enormous amount of Christmas pics that I hope to find the energy to edit before Christmas 2009. Dan and I had planned to drive around and look at holiday lights last weekend, but a blizzard squashed that notion, so we did it Tuesday night instead. I do wish the local newspaper would quit listing streets that no longer participate in the "Christmas lanes" because it would have saved us a lot of time, but the few that did pan out were very entertaining. And I did have my annual Starbucks cafe mocha; it seems to taste twice as good when I only let myself have one a year. After we got home, our friends Greg and Angie came by bearing gifts and some muscle to help move some furniture back into place in the basement. They and Dan pooled their resources together to get me an AWESOME toy! A stereo that converts vinyl and cassette onto CD; my iTunes playlist is gonna get HUGE now! Yesterday, we went to our church service at 7pm. It had a choir, musicians playing trumpet, violin and cello and readings. I kept messing up on the carols because they were using versions with newer lyrics (why?? ), and during the candlelight portion, wax dripped onto my pants and stained them, but other than that, a nice service. Afterward, we drove to Dan's sister's house where there were 11 people waiting for us to exchange gifts. Rather chaotic, and I took plenty of pics to prove it, heh heh. By the time everything was unwrapped and everyone had had a cookie or two, it was 11pm, just barely enough time for the kids to get to sleep before Santa's arrival. Today, I took it easy for awhile, trying to save up energy for dinner. Read the paper and watched "A Christmas Story". My dad surprised me by calling about 2pm; we talked about half an hour I think. We headed back to my sister-in-law's house at 4pm. I was able to eat some turkey, mashed potatoes, a few bites of other veggies, a couple of cocktail shrimp, Watergate salad and a sliver of crustless pumpkin pie. Dan learned how to play games on the Wii, which was pretty entertaining to watch. I crashed about 7pm and had to call it a night. Once home, Dan and I watched the Alistair Sim version of "A Christmas Carol" because I was too brain dead to view anything I hadn't already memorized. I also ate some pecan pie filling Dan's mom sent home with me; hadn't had pecan pie since before my mom died in 1997, and I probably shouldn't do it again since it's pretty much just corn syrup and butter, but it WAS tasty I'll admit. Now I feel barely conscious, and my pain level is pretty close to a 10, but it was probably worth the effort. I'm hoping the muscle cramps I've had this week will finally let up and that I'll get some real sleep. I'm gonna go try that right now. Received this forwarded message from someone in our Drug and Alcohol Prevention program ... Wonder if the job is getting to him? 1. Sample the Crown Royal to check quality. 2. Take a large bowl, check the Crown Royal again, to be sure it is of the highest quality, pour one level cup and drink. 3. Turn on the electric mixer...beat one cup of butter in a large fluffy bowl. 4. Add one teaspoon of sugar...beat again. 5. At this point it's best to make sure the Crown Royal is still OK, try another cup.. just in case. 6. Turn off the mixer thingy. 8. Mix on the turner. 9. If the fried druit gets stuck in the beaterers just pry it loose with a dewscriver. 10. Sample the Crown Royal to check for tonsisticity. 11. Next, sift two cups of salt, or something....who giveshz a sheet. 12. Check the Crown Royal. 13. Now shift the lemon juice and strain your nuts. 15. Add a spoon of ar, or somefink ... whatever you can find. 17. Turn the cake tin 360 degrees and try not to fall over. 19. Finally, throw the bowl through the window. 20. Finish the bottle of Crown Royal. 21. Make sure to put the stove in the dishwasher. 1. The lad is a diminutive percussionist. 3. The smog-less bewitching hour arrived. 5. Do you perceive the same longitudinal pressure which stimulates my auditory sense organs? 6. Far back in a hay bin. 7. Leave and do an elevated broadcast. 8. Wanted in December: top forward incisors. 9. We are Kong, Lear and Nat Cole. 10. Our fervent hope is that you thoroughly enjoy your yuletide season. Gift bags. Too painful to wrap stuff the old-fashioned way. I've had fake trees my whole adult life because they are easier to maintain. When I was a kid in Denver, a real tree would dry out so much that you couldn't have it up for more than about 10 days without losing all the needles, so we would always put it up about December 15. But Dan wants to put it up the week of Thanksgiving, and since our tree is fake, I let him. I just LOVE it! But now with my immune system being suppressed, it isn't safe to drink the homemade kind because it contains raw egg. So I just stick with the pasteurized stuff from the grocery store. I got lots of cool stuff, but the most unusual one was a large edible house made of chocolate from my great aunt in Memphis. Usually people who automatically go out and get everything they want when they want it. Surprisingly, no. Unless you count ones depicted on ornaments. Most years, I do e-mail for people who have computers and snail mail for those who don't. But this year, I had an entire month without regular access to my own computer, so I snail mailed a record 50 cards. Can't remember specifics, but probably one that was clearly meant for someone else. I'm gonna cheat and pick two. Fave funny Christmas movie: "A Christmas Story". Fave traditional Christmas movie: the Alistair Sim version of "A Christmas Carol". No, but I have been the recipient of some. I take this to mean treats? Of the stuff I can still eat, mint M&Ms. Of course. The tree would be incomplete without it. Non-traditional: "Colorado Christmas" by the Dirt Band. Traditional: maybe "Silent Night"? I would like to travel but must stay in town. Dasher, Dancer, Prancer, Vixen, Comet, Cupid, Donner, Blitzen, and of course, Rudolph. I have both and tend to alternate them. When I was a kid, we opened one small gift Christmas Eve and waited until Christmas morning for the rest. But now that I'm in South Dakota, his family opens everything Christmas Eve, which I find exhausting and a little weird. Rude, stressed out people who think it's all about material goods. I like the handmade ornaments best, especially the ones my mom made from eggshells. My tree is unique. Spiral sliced, honey glazed ham. The reallllly expensive kind. 25. What do you want for Christmas this year? I was unable to shop this year, so I am not expecting anything. Yes, at long last, the basement is fully repaired! It was finished on Thursday afternoon. And this morning, I got the vents professionally cleaned, which was much needed to get rid of all the construction dust, pet hair, etc. that had accumulated in there and that was aggravating my asthma. Now I am in the process of putting things back in their rightful place and finding places for things that no longer have a home. The cabinet that had been in the scrapbook area was too damaged to be re-used, so I had some shelves put on the wall instead. And Dan's mom gave me a dresser that had belonged to her grandmother (or was it great-grandmother? ), so I put my camera equipment and some scrapbooking supplies in there. I am also in the midst of cleaning the entire house. There is dust from the fireplace destruction all the way upstairs in every single room. And as usual, I can't do more than one room in a day, so this is gonna take me awhile. The final tally was even higher than I had feared. Optimistically, the soonest I'll be able to pay this off is two and a half years from now. And at the moment, I ain't feeling that optimistic. But I finally have a livable basement again, with twice as much insulation in the new areas as before and double pane windows to keep out the cold. My Gazelle glider is in its new permanent home in the space where the fireplace had been so it will no longer be in the way of anything else. The electrical problems have been fixed so that the lighting downstairs will quit shorting out. And if I find myself in the unfortunate position of having to sell the house, it might be worth a little more than before. My goal for tonight, though, is to sort through the 80 remaining un-viewed e-mails and 150 Facebook requests. Wish me luck! It appears that the sitting President has been looking for a way to end his reign by one magnanimous act, just like a warlord on his feast day. He will put his finger in the dike, and the fragile mess of an auto industry will eke through the next few months. Nope, it's not done yet. Nope, I shouldn't be surprised. Yep, I'm gonna be broke for even longer than I had feared. Turns out the water damage to the storage area extended all the way across the room, so we had to have two entire walls of drywall and insulation replaced in addition to the scrapbook area. The handyman guys ran air scrubbing machines to mitigate the mold and other impurities. And we found out the flooring Dan put in a year and a half ago was already falling apart due to all the moisture, so we're having it replaced with something more durable that has been properly prepped. And we found out why the storage area had been flooding. Turns out that under the wooden deck in our back yard is an old patio slab that slopes TOWARD the house (couldn't see it until the deck was taken apart), and so all water in that area drains directly into the window well! Would cost us a fortune to have the slab removed completely, so they put up a little cement lip around the window well to get the water to roll away from it, and if that doesn't end up being sufficient, we'll have them come back in the spring, rip up the deck again and drill holes in the slab so the water will drain further away from the house. The electrical problems we've had in the basement are more extensive than we thought. The previous homeowners obviously wired it themselves, and did it incorrectly. The poor handyman guy got zapped on Friday! And the fuse box is labeled incorrectly, so figuring out what really controls what is an adventure. For some reason, lights in the garage and outdoors are connected to stuff in the basement?!? Anyway, we're gonna get to the bottom of the short circuits and the stuff that was supposed to be up to code but isn't. If that weren't fun enough, there is a leak in the downstairs bathroom, and the source is apparently located behind a built-in cabinet. In re-assembling the scrapbook area, we discovered that cabinet is too water-damaged to be reused. So we're putting the desk in a different spot as it had been attached to the cabinet, and I have no idea where I'm gonna store my scrapbook supplies. The project that was originally supposed to be two weeks has gone past three into a fourth. I'll be covering up the command center with plastic again tonight before I go to bed. Looks like I might not be online again until maybe Thursday?? I did some number crunching on the most recent figures. The earliest we will possibly get this paid off will be 2011!! YIKES! 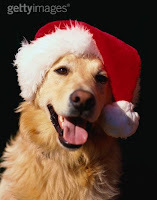 Would like to be posting again regularly before Christmas, but can't promise anything. Such are the joys of being a homeowner.